This post has been sponsored by Campbell's Soup. I have been compensated but all opinions are my own. When it comes to meals, many times we we as parents are just happy when our kids eat three bites of the meal that was lovingly made for them. Ok, lovingly sometimes could mean, "It's what we had in the fridge and I still need to make muffins for the PTA bake sale tomorrow." However, much of the time the meal is put together with the best intentions. What happens after cooking though is the real challenge. It is what I like to call "Manners at the Dinner Table: Family Style." Sometimes it is known as, "I've told my kids 5,000 times what's appropriate, yet they seem to have short term memory loss." Either way, if you are a parent of a young child, you can probably relate or you have your own list of dinner table manners that your kids live be. Be sure and share them on social media using #RealRealLife, because there's not much more real about parenting life than braving the dinner table with kids! 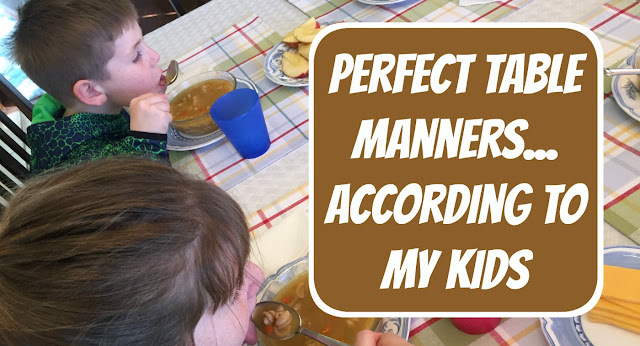 Here are five dinner table manners that my kids like to believe are acceptable, but should be illegal in 48 states. 1. If the parent is cooking dinner, your child asking for a snack is perfectly logical. It doesn't matter what stage the dinner preparation is in. You could literally be moving the food to the dinner table and your child will still wander in and boldly proclaim, "I'm starving, can I have a snack?" 2. No matter what food you just made, your kid will beg for something else. You could have spent the last 45 minutes dazzling the rest of your family with your prowess in the kitchen. You might have even cooked your child's favorite meal of all time. There is a good chance that your kids haven't even seen what the food is, but they will still say they don't like _________, and resort to blackmail/bribery/wailing/hunger strike to get out of eating it. 3. There is nothing wrong with your children getting up from the table 5,323 times. Your kids have many important jobs to finish throughout the day, which includes during dinnertime. You cannot reasonably expect their lives to revolve around your schedule. To an adult it might seem like the kid leaving the table to change their socks, get their action figure, or write a note to their dog is inconsequential, but it's just because that parent is old and doesn't understand kids today. 4. If a kid's mouth enjoys the food, they are required to share the meal with their kneecaps, ears, and eyebrows as well. Every once in awhile the stars align and you make the perfect meal. For my kids it's usually something shaped in a fun design. For my sons it's something like star shapes and for my daughter anything "Frozen" themed works. Easy parent hack: Mix Campbell's Organic Kids Chicken and Stars with Campbell's Organic Kids Frozen themed soup and you'll have one of those "stars aligned" meals that makes everyone happy. When a needle in a haystack meal does occur, your child thinks so highly of it that the food somehow gets behind their ears, down their shirt, and between their toes. It doesn't even matter that they were wearing shoes because that food defied the laws of physics to get there. You don't even remember making enough servings of the meal for your child to be full and at the same time be covered in the magical physics defying food. 5. If an adult loves cooking the dinner, they definitely enjoy cleaning it up twice as much. One of my children once said, "Dad you can't do the laundry, mommy loves washing clothes because she spends so much time doing it." I'm pretty sure that sentiment carries over into clearing the table and doing dishes as well. Since parents love cooking they must really love cleaning up the kitchen too. Can you relate to these #RealRealLife dinnertime table manners above? Even though my children's manners sometimes make me think they see no practical reason to use silverware, it's the short fulfilling moments that make all the other times worth it. Those are the moments when I get to hear about their day, watch them show kindness to their siblings, and have one of those special discussions that show they are growing up and thinking about issues that matter. Dinnertime is family time, and no matter what "manners" are displayed, these are moments that I wouldn't trade for all the quiet, clean, and drama free meals in the world. 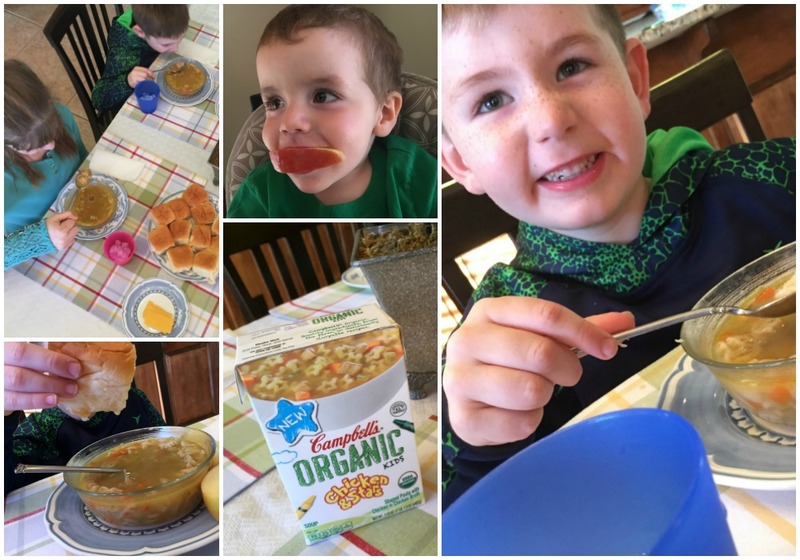 Make sure and remember to share your #RealRealLife dinnertime table manners on social media and check out Campbell's Organic Kids Soup for that physics defying, magical food that I mentioned above. Campbell's just might be help the stars align at your next dinner!